President of the Committee of the Film "The Gift from Beate"
"Let’s give birth to the small and then make it grow"
– I recall saying this to calm down women who were protesting against the draft Equal Employment Opportunity Law. They argued that the draft was insufficient to ensure the equal opportunity between sexes at work in Japan. At the time, I empathized with Beate, her hard work and lonely fight, which ultimately ensured that the basis for the well-being of Japanese women would be sufficiently and securely embedded in the new Japanese Constitution. 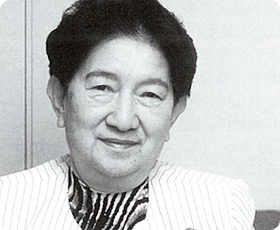 As a member of the drafting team of the new Constitution, Beate dedicated heart and soul to the cause of the advancement and wellbeing of Japanese women. Although many articles, spawned by young Beate’s pure-hearted and prayerful attitude, had to be excluded from the Constitution, the articles that were included did establish human rights for women and gender equality under the Law. Seeds that are now deeply rooted and embodied in Japanese women as an assurance for the future. I believe that Japanese women, who lived in the era right after the Second World War, carefully nurtured the seeds sown by Beate’s heart-felt prayers. Seeds that ever since have started bearing delicate but fine fruits. In the past, Beate’s father, Leo Sirota, the famous concert pianist, took great pleasure in teaching young Japanese pianists. In many respects Beate followed in her father’s footsteps by presenting her Gift to Japanese women. I am pleased to present this film, "The Gift from Beate" as a gift from Beate S. Gordon and the Committee of the Film "The Gifr from Beate" in the hope that younger women and future generations will fulfil their potential in even more significant ways than women of previous generations have done so far. A number of publications related to the Equal Employment Opportunity act. Copyright © 2004 - 2014 The Committee of the Film "The Gift from Beate" / Image Brain Inc. (Nihon Eiga Shinsha) All rights reserved.